She’s been described as the “Chopin of ceramics” because she creates a lyricism without sacrificing tough aesthetic principles, and a “potter’s potter” because her tactical aesthetics are crucial to all those interested in ceramics as art. Linda Arbuckle is an associate professor of ceramics in the School of Art and Art History. Arbuckle’s artistic focus is on majolica bowls, cups, platters and other utilitarian pieces. Majolica is a low-fired earthenware ceramic, fired to a “biscuit” or unglazed stage, then coated with an opaque unleaded glaze. Intricate designs are then painted on this glaze with brightly colored metal oxides. A second firing causes the opaque glaze and the metal oxide glazes to interact to create deep, brilliant colors. Described by a colleague as “one of the most well-known and respected ceramists in the United States,” Arbuckle is active in the ceramics field. As former director-at-large for the National Council on Education for the Ceramic Arts, she developed a website and participates in the Clayart Listserv, where she regularly offers advice to thousands of ceramics enthusiasts in more than 30 countries. 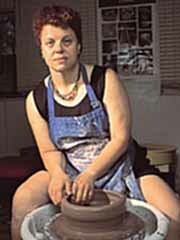 Arbuckle’s work has been exhibited throughout the United States and featured in numerous ceramics books and magazines. Awards and recognition highlights of the last five years include a National Endowment for the Arts Artists Fellowship, an invitation to present a lecture at the Renwick Gallery in Washington, D.C., and the purchase of one of her works by the Weisman Museum in Minneapolis. “Working with low fire materials, making useful objects by hand, is truly an opportunity to be an alchemist, turning base materials into gold,” Arbuckle says.